When it is hot outside a frustrated raccoon can be calmed with a nice, cold popsicle. A nice relaxing sprinkler can be refreshing for even a raccoon on a summer day. 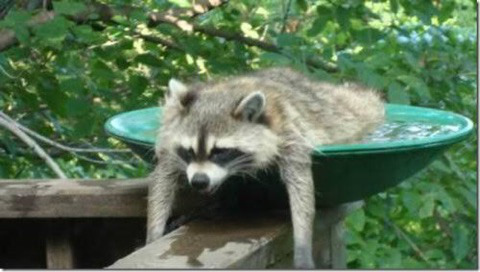 A birdbath can make a nice pool for the discerning raccoon. Bonus: Here is a mama bear and her two cubs enjoying a relaxing dip in a pool.